DEAR MAYO CLINIC: I rarely use table salt anymore when cooking. Instead, I like to use sea salt. But I've noticed that a lot of sea salts don’t contain iodine. Do I need iodized salt, or are there sources of iodine other than salt that are likely giving me all of the iodine I need? ANSWER: For most people, iodized salt is probably the easiest way to maintain sufficient iodine intake. Iodine is an important nutrient that your thyroid needs to produce certain hormones. Not getting enough iodine in your diet can lead to problems such as an enlarged thyroid gland (goiter) and an abnormally low level of thyroid hormones (hypothyroidism). Iodine is a trace element present in the earth. Distributed variably around the world due to the effects of the ice age, iodine has accumulated primarily in coastal areas. The most common dietary sources of iodine are seaweed, fish and dairy products. Inland areas have fewer natural sources of iodine. In the U.S., areas where iodine deficiency was common in the early 1900s —the Great Lakes, Appalachians and Northwest — were known as the “goiter belt.” Researchers from these areas encouraged the U.S. to adopt table salt iodization as an inexpensive, yet universal, way of providing iodine supplementation. Although salt iodization never was made mandatory, estimates are that more than 90 percent of U.S. households today have access to iodized salt. Other sources of dietary iodine include eggs, enriched grain products and plant foods grown in iodine-rich soils. 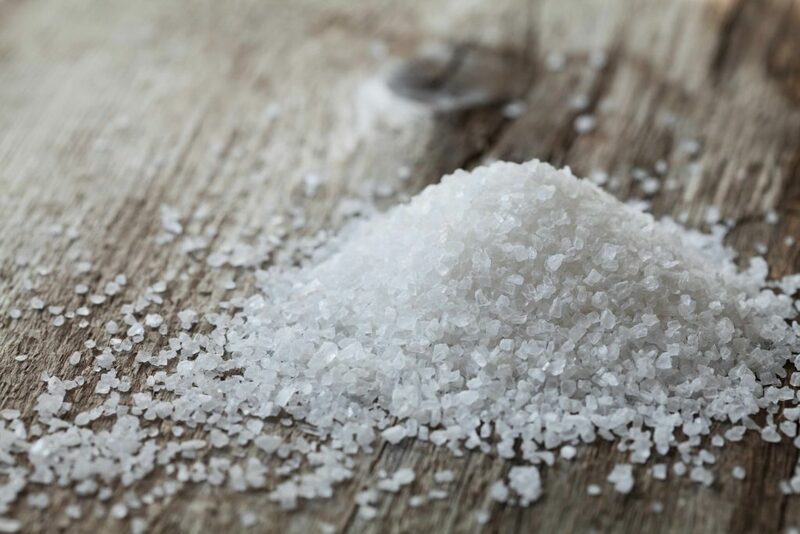 Unfortified sea salt contains only a small amount of iodine. Still, it’s hard to determine precisely how much iodized salt contributes to an individual’s iodine levels. Iodized salt in the U.S. contains 45 micrograms of iodine per gram of salt. The recommended daily intake for adults is 150 micrograms, which can be obtained from about one-half to three-quarters of a teaspoon of table salt. Testing of the general population indicates that most Americans consume sufficient levels of iodine through their diets. Pregnant women and nursing mothers are the only groups in the U.S. that are advised to take a daily iodine supplement, usually as part of a prenatal vitamin.